Stop in to complete your purchase. Unavailable for online purchase. The monthly Unlimited Wash Club provides unlimited car washes in each month the membership is renewed, and can be cancelled at any time. Cancellations must be received at least seven (7) days prior to next billing date; otherwise you may be charged for that month and the cancellation will not be effective until the following billing date. Orloski’s Car Wash reserves the right to close stores due to inclement weather, holidays, equipment maintenance, and location upgrades. No refunds or credits will be given for partial periods for any Unlimited Wash Club program. Orloski’s Car Wash reserves the right to cancel, amend or change the program, including but not limited to the Membership fees, from time to time as necessary. Only the car listed on this form is eligible for the Wash Club and must have a Orloski’s bar code tag affixed to the vehicle that is placed by an Orloski’s manager. Any attempt to remove the tag will destroy the tag any prevent it from operating. Member must notify Orloski’s Car Wash of any change in vehicle ownership. This agreement will be governed by the laws of the Commonwealth of Pennsylvania and Member consents to the exclusive jurisdiction and venue of the state or federal courts located in Luzerne County, PA. I agree that my acceptance of Orloski’s Club bar code tag shall be my acceptance of and consent to the terms set forth above. 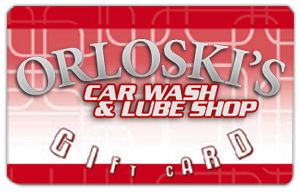 Purchase a Orloski's Car Wash & Lube Shop gift card or a Peel-ADeal Card for yourself or for someone else. They make the perfect gift!